While "sharing the road" is a fine ideal for which to strive, the reality in the meantime is that cyclists need every trick they can find to make sure car drivers see them. To that end, there are any number of blinking, moving, bright, eye-catching bike lights - and here's one more with a neat twist. The Light Lane, from Altitude's Alex Tee and Evan Gant, uses lasers to project a bike lane around the biker - complete with the standard "Bike Lane" symbol. While this improvised lane certainly doesn't qualify as legally binding, it probably will get any car driver's attention just for being unique and eye-catching - and that's the whole point. Stay safe, kids! So... a pretty interesting idea that gets at the core of dynamically alerting drivers when a biker is nearby. I want to say I think this is a great concept and should be pursued (despite my comments below). 1- One is the ease of implementation and likelihood of adoption. I assume implementation would be easy if these are truly just low-powered LED lights that can project reliably for a long time and are easy to attach to the frame. But will cyclists use it? I can only assume serious cyclists will... and perhaps they are more likely to bike at night anyway. So I just want to see further specs and ethnographic studies. 2. Assuming there is adoption, do you think it could possibly DISTRACT drivers more? Especially if they don't expect it? Perhaps the cyclist is avoided before the driver figures out what he is looking at... but if the projection is not clear enough or is just too much of a novelty... does the driver lose focus on the OTHER parts of the road that he must be attentive to? Stanrun, thanks for your excellent comments! 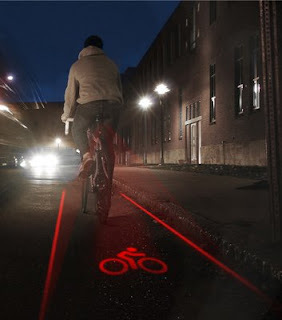 Personally, I'm pretty sure that the concept-killer in this case is engineering feasibility: I don't think there are lasers (or LEDs) powerful enough to make a bright-enough projected lane, without requiring new batteries for every single bike trip. But you make great points about the potential distraction of car drivers due to the very novelty of the product that was supposed to alert them to the biker. Tough stuff!